Second Chasing Mavericks Movie Trailer Hits. Gerard Butler, Jonny Weston, Leven Rambin and Elisabeth Shue star in the Jay Moriarty surfing biopic. Watch the movie trailer for Chasing Mavericks. 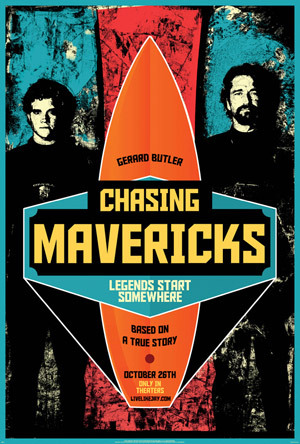 Based on the inspirational true story of big wave surfing legend, Jay Moriarity (Weston), and his unique friendship with veteran surfer, Frosty Hesson (Butler). As a teenager, Jay goes on a quest to take on the massive and deadly waves, known as the Mavericks, off the coast of Half Moon Bay. What begins as a mentorship turns into a unique bond, as the two unlikely friends discover that there is nothing more powerful than pushing your limits and chasing a nearly impossible dream. MPAA Rating: (PG) for thematic elements and some perilous action. CHASING MAVERICKS is the inspirational true story of real-life surfing phenom Jay Moriarty (played by newcomer Jonny Weston). When 15-year-old Jay discovers that the mythic Mavericks surf break, one of the biggest waves on Earth, is not only real, but exists just miles from his Santa Cruz home, he enlists the help of local legend Frosty Hesson (Gerard Butler) to train him to survive it. As Jay and Frosty embark on their quest to accomplish the impossible, they form a unique friendship that transforms both their lives, and their quest to tame Mavericks becomes about far more than surfing. Chasing Mavericks was made with the help of some of the biggest names in the surfing world, and features some of the most mind-blowing real wave footage ever captured on film.